The special forces of the LRDG, SAS and SBS were an eclectic mix of largely non-conformist characters as befits the vital roles they played in the war. As such their attire was a mix of that of their parent unit, national pride or personal preference! This set is ideal to mix with our plastic 8th Army set with the tin helmets, Scottish Tam-o’shanters and Indian headgear creating a truly unique army on the tabletop! 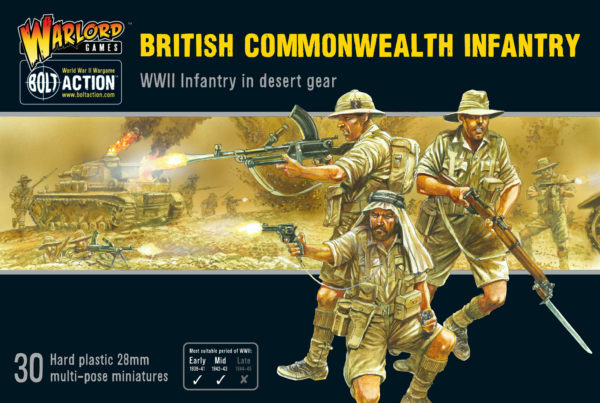 30 British Commonwealth miniatures. Includes a host of options to allow for different weapon configurations and command models. The post Pre-order: British Commonwealth Infantry appeared first on Warlord Games.